In October 2012, Hurricane Sandy was a wake-up call to residents of the northeastern United States. Pennsylvania residents prepared for flooding and high winds, but were caught off-guard. Those of us who were fortunate enough to emerge from the storm unscathed remember the lengthy power outages. Here we are again, in the middle of hurricane season. The surge of generator sales following Hurricane Sandy has left many feeling more prepared. However, if used improperly, one could lose more than just electricity. Carbon Monoxide is a concern in every household. This deadly gas is odorless, those who succumb to it never realized it was present or being inhaled. • Whether you own a generator or not, install a Carbon Monoxide detector. Check it regularly to make sure it works properly, and replace the batteries. 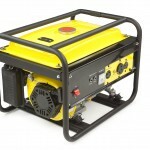 • NEVER use a generator indoors, no matter how much ventilation may be present. This includes in an open garage. • Locate the generator outside, away from the house. Take care to keep it away from doors, windows, or vents that could allow the gas to come inside. Pick a safe location to set it up, and do a test run to make sure necessary cables are long enough. • READ THE INSTRUCTIONS that came with the generator. Make sure it works properly, and perform any recommended maintenance. Search the internet and check with the manufacturer to make sure it was not recalled. With these tips in mind, you and your family can rest easy as the next storm approaches.